Check out this head to head video between Vitali Klitschko and Derek Chisora as they discuss their upcoming fight. The video is of a similar style to HBO’s award winning 24/7 “Faceoff” and Showtime’s “Staredown”. It’s definitely worth a watch just to see some of the stuff Del Boy comes out with. Here are a few select videos that I’ve come across that should help everyone get pumped up for the fight (not that you should need to). 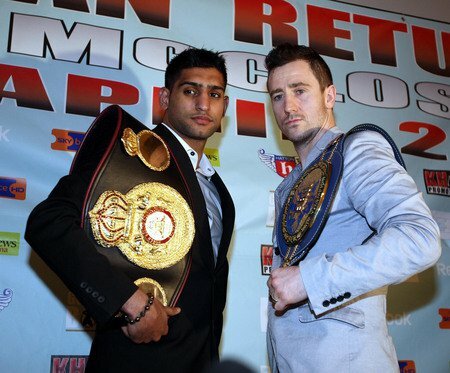 Amir Khan takes on Paul McCloskey in a defence of his WBA light-welterweight crown tonight (Saturday 16 May) at the MEN Arena in Manchester. Khan has come under criticism from some quarters for taking this fight on but with Khan wanting to fight around this time of the year, was there really another viable opponent? Those expecting him to fight Juan Manuel Marquez or Bredis Prescott are quite deluded. Marquez, despite his age, is still a class above Khan, while Bredis Prescott was no more than a flash in the pan who was school by Kevin Mitchell last year. We all know it’s a stay busy fight for Khan who should win before going on to face American Timothy Bradley this summer in a unification bout, that is assuming everything goes to plan for the Bolton-born boxer who has had to deal with the fight being withdrawn from Sky Sports and moved to Primetime cable network. So Khan’s will need to display the mental toughness he showed following his defeat to Prescott and in those few rounds when rocked against Maidana. The last time Khan was expected to walk over an opponent like this was when he faced his darkest hour – as he suffered a KO at the hands of Bredis Prescott. Now I’m not saying McCloskey will do this to Khan as Khan has become a better fight under the guidance of renowned coach Freddie Roach. But McCloskey is a tricky opponent who is undefeated and he’s coming over here with a real desire to win. He’s not just here to make up the numbers. He can punch and be very awkward at times with the way he throws his punches. Some people forget that McCloskey is a champion in his own right and he has every chance of causing an upset. He is the total underdog and has nothing to lose but everything to gain. If Khan starts quick, which he tends to, and McCloskey has his mind elsewhere this could all be over within 4 rounds. However if McCloskey can weather the storm in the first few rounds then he has a punchers chance. McCloskey’s best bet is to draw Khan into a toe to toe battle because McCloskey can punch and Khan’s chin is still questionable despite his performance against Maidana. But I think Khan will have too much hand speed and power for McCloskey and I believe Khan will come into this fight with a real desire to put a show on for his homecoming fight. I can see Khan winning via KO inside 7. See below for HBO’s Max Kellerman’s prediction. Don’t forget to tune into Primetime from 8pm to watch the fight.